The great view of Kanchenjunga, 3rd highest mountain in the world. Different experience of Glacier Walks. Scenic view of Mount Makalu and east view of Mt. Everest. The interaction with peoples from different ethnic groups. Rhododendron forests, native vegetation, high alpine passes and typical agriculture. Abundant wildlife species like Musk deer, snow leopard, blue sheep etc. Before Mt. Everest was explored and declared the highest peak of the world, Mt. Kanchenjunga used to be considered as the highest peak in the world. Kanchenjunga (8,586m) is the third highest Peak in the world. Kanchenjunga Trek is one of the least explored trekking trail of eastern Nepal. Trekking to Kanchenjunga offers you the lifetime memories of the wonderful snowcapped mountains, landscapes and exotic scenic view of the giant Himalayas. Many high snowy peaks above 8000m and some peaks less than 8000m can be observed directly in front of our eye. The popular peaks like Mt. Everest (8,848m), Mt. Makalu (8,201m), and Mt. Lhotse (8,516m) can be observed on Kanchenjunga Trek. Kanchenjunga Trek has been described as the best trekking trail of Nepal by many trekkers. This is an extensive trek going deep into the remote mountain ranges. You will enjoy the wild range of scenery from lush, tropical jungle to rhododendron, chestnut and oak forests and at higher altitudes into the alpine zone. You will explore the diverse Nepalese culture and lifestyles from Rai and Limbus to Tibetan Buddhist Villages. From the Kanchenjunga Base camp we can see the amazing panoramic views of white snowcapped mountains. Spring season is best for this trek as you can encounter over 40 species of Rhododendron in bloom throughout the trek including Nepal’s national flower, the scarlet Lali Gurans. The trail goes along the villages of Limbu, Rai and Sherpa people and if you are lucky enough you may be welcomed to dance and sing in one of their many festivals, or to try the warm mildly Tongba. The whole trek will be fun and scenic. 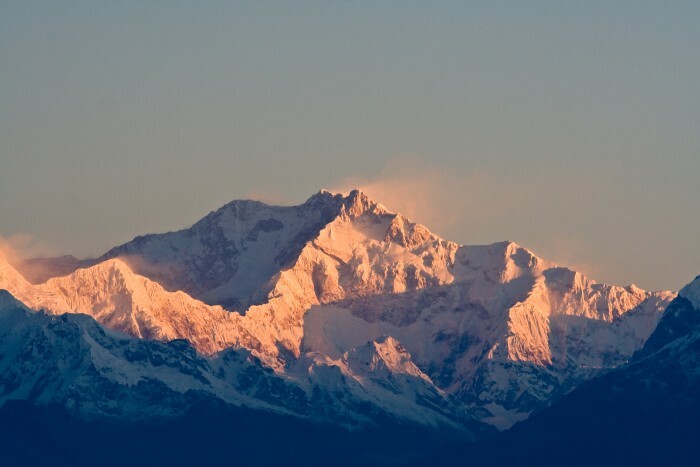 Kanchenjunga lies in the boarder of Nepal and Sikkim (India). It is called Five Treasures of Snow after its five high peaks, and also worshipped by the people of Sikkim and Darjeleeling. Before Mt. Everest was explored and declared as highest mountain, Kanchenjunga was assumed to be the highest mountain in the world. After the final calculation in 1849 the Mt. Everest was declared as highest mountain and the Kanchenjunga, third highest mountain in the world. So the trek to Kanchenjunga gives you the opportunity to feel the third highest peak of the world very closely. This trek is comparatively easy and can also be done by small adventurous group as a tea house trek. Homestay is available in the trail which cost comparatively less so it is affordable and adventurous tour for most of you. Domestic flight to Bhadrapur and back to Kathmandu. On arrival to Tribhuwan International Airport you will meet our representative ready to welcome you. He will take you to the hotel room. You can relax the rest of your time in Hotel room. There will be short briefing about the tour. And Dinner in Kathmandu. Day 02: Fly from Kathmandu to Bhadrapur and drive to Illam. We will take a morning flight from tribhuwan International Airport to Bhadrapur. It takes approximately 45 minutes.Then we continue our journey with a long drive (3-4 hours) to Illam. Illam is famous for tea. This is the largest tea plantation area of Nepal. We will stay overnight in Illam. Included meal: Breakfast, Lunch, Dinner. Day 03: Illam to Taplejung Drive: 6-7 hours. We continue our drive to Taplejung. Enjoying the great scenario from the Bus we reach to Phidim continue our journey to reach Taplejung for our overnight stay. Day 04: Taplejung to Mitlung Trekking [921m] : 5-6 hours. Today our actual trek starts. On the next couple of days we walk through the green and diverse mid hills, following shimmering rivers and contouring around precipitous ridge lines. The villages we pass through are Hindus and Buddhists with traditional mod brick houses. Today descend to the Tamur river and then follow it upstream. We will follow the great Himalaya trail cultural route which will take us through some of Nepal’s most remote villages. Overnight stay at Home-stay/ Lodge. Day 05: Mitlung to Chiruwa Trekking [1270m] : 5-6 hours. We will have quite challenging walk today as we follow rough paths high above the river. 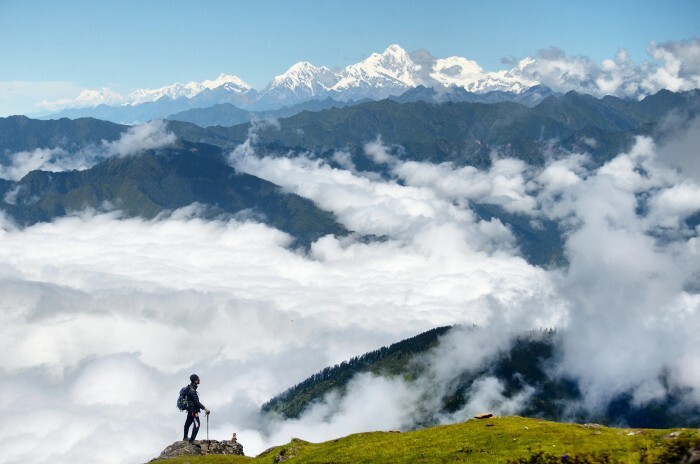 The trail passes through the Limbu and Tamang villages of Sinuwa, Tawa, and Porke. Then after short wal we finally descend to the Thiwa Khola crossing the bridge. After some ups and downs we will reach the small town Chiruwa. Overnight stay in Chiruwa. Included meal: Breakfast, Lunch, and Dinner. Day 06: Chiruwa to Sukethum Trek [1579m] : 5 hours. Our trail follows the Tamur River and climb a spur before descending to Simbhu khola – River originating from the Yalung Glacier on the south of Mt. Kanchenjunga. Passing through the Limbu, Rai, Tamang and Sherpa villages and crossing the rivers and streams we reach to Sukethum. Overnight stay at Sukethum. Day 07: Sukethum to Amjilosa [2308m]: 6 hours. From Sukethum, we head northeast along the Ghunsa Khola gaining altitude as we trek towards Kanchenjunga Base Camp. Passing the beautiful terrains and crossing streams and river we will finally reach to the Tibetan Village; Amjilosa. We can exp[erience the Tibetan culture in that village. Overnight stay in Amjilosa. Day 08: Amjilosa to Gyabla Trek [2730m] 5-6 hours. Today’s walk will be through Rhododendron and Bamboo forests. Today we will explore the beautiful waterfall on the way. By going ups and downs we finally reach to Gyabla. Gyabla is the most beautiful campsite of the trek, with amazing views. Overnight stay in Gyabla. Day 09: Gyabla to Ghunsa Trek [3595m]: 5-6 hours. Today we head for Ghunsa – the largest and last village in the valley. It is picturesque Tibetan village with wooden houses and a micro hydropower. There is small Kanchenjunga Conservation Area office and several shops and lodges plus a couple of gompas. From Gyabla, we pass through a broad meadow and pass a village, and gently climb a hill before descending to cross the river into the village – Ghunsa. Overnight stay in Ghunsa. Today we will take morning hike to the other side of the river upto the height of about 400m, taking about 3.5 hours for the round trip. Rest of the day can be spent relaxing or exploring the Beautiful Tibetan Village Ghunsa. Overnight stay at ghunsa. Day 11: Ghunsa to Khangpachen trek [4050m]: 7 hours. Making a gradual ascent from the Ghunsa, we pass through the beautiful rhododendron and pine forests along the south bank of the Ghunsa khola. Crossing several scree slopes and moraine and passing through the several maniwalls and chortens we reach to the Khangpachen village. Khangpachen is a Tibetan settlement surrounded by mountains and offers very impressive view of the huge north face of jannu. Overnight stay in Khangpachen. Day 12: Khangpachen to Lhonak Trek [4780m]: 7 hours. Today we will hike along a high plateau past the intersecting Lhonac glacier to our left and reach the high, flat campsite of Lhonak. Although it’s an old campsite, it offers great views of some of the highest peaks on the world – Wedge Peak (6750m), Mera Peak (6344m), Nepal Peak (6910m), Twins (7351m) among others. Overnight stay in Lhonac. Day 13: Lhonac to Kanchenjunga Base Camp Trek [5143m]: 3 hours. We head directly east after leaving Lhonak and follow the sme glacier on the northern ridges to the Kanchenjunga North Basecamp, also called Pang Pema. Camping here is one of the Highlights of the trek. In the Kanchenjunga Base camp we can find ourselves surrounded by the giant mountains. Overnight stay here. Day 14: KBC to Ghunsa Trek [3595m]: 8 hours. Today we will have long walk to Ghunsa. Retracing our footsteps back and enjoying the eye catching views we reach Ghunsa in almost 8 hours. Overnight stay in Ghunsa. Day 15: Ghunsa to Highcamp Trek [4100m]: 4-5 hours. Today we follow steep rocky trail from beautiful forests that will finally takes us to the Highcamp below the Sele La Pass. Overnight stay in Highcamp. Day 16: Highcamp to Tseram Trek [ 3870m]: 8 hours. Today we will hike up to the passes Sele la (4,480m) and Sinion La (4,660m). After completing the final pass of the day we descend approximately 1000m to Tseram. Overnight stay in Tseram. Day 17: Tseram to Ramche Trek [4,580m]: 7-8 hours. Today we head up to Ramche, where we pass the snout of the Yalung glacier. We can see the highest Peaks in India Nepal Boarder- Koktang(6,147), Rathong(6,679) and some of the Kabrus which are all over 7,000m.We can explore the lake and a meadow in Ramche. Overnight stay in Ramche. Day 18: Explore Yalung Base Camp [4500m]: 7-8 hours. Our trekking is pretty adventurous today as we have to walk along the glaciers. We have to walk through the moraines and strenuous rocky paths. After crossing Oktang glacier, the panoramic views of Mount Kanchenjunga and Mount Jannu along with other giant peaks captivate your emotions completely. Overnight stay in ramche. Day 19: Ramche to Anda Phedi Trek [3390m]: 5 hours. Today we retrace back to Andaphedi. On the way we will enjoy the scenic landscapes, forests and streams and great mountainous views. Overnight stay in Anda Phedi. Day 20: Andaphedi to Tortong Trek [2995m]: 5 hours. We will have comparatively easy walk today as we descend on almost all the way to Tortong. We pass through the Rhododendron forests and finally reach to Tortong. Overnight stay in Tortong. Day 21: Tortong to Yamphudim Trek [2080m]: 5-6 hours. We walk steeply down to Imja Khola then cross the Dubi Pass and descend to Yamphudim. Yamphudim has mixed communities of Sherpas, Rai, Gurung and Limbus. Overnight stay at Yamphudim village. Day 22: Yamphudim to Khebang Trek [1915m]: 5-6 hours. We descend through the streams and forests with the good views of mountains and reach Khebang for the overnight stay. We walk through the beautiful and silent forests and crossing the streams, reach Khanidingbe for overnight stay. Today we will have a long drive to Birtamod in our private vehicle. We will enjoy the scenario from vehicle. Overnight stay in Birtamod. We will take morning drive to Bhadrapur and from there we will fly to Kathmandu. We will reach Kathmandu in 45 minutes. We can relax in the rest of our time. Today is the last day of our Kanchenjunga Trek. Our representative will drop you to the Tribhuwan International Airport 3 hours before your scheduled flight. We wish for your safe journey with the hope to see you again.